More people have more tattoos in more places than ever before. If you're considering getting inked, choosing the design is now the hardest part, and we've spoken to some of the world's top tattoo artists to find out more about the tattoos they love and the ones they're not so keen on. 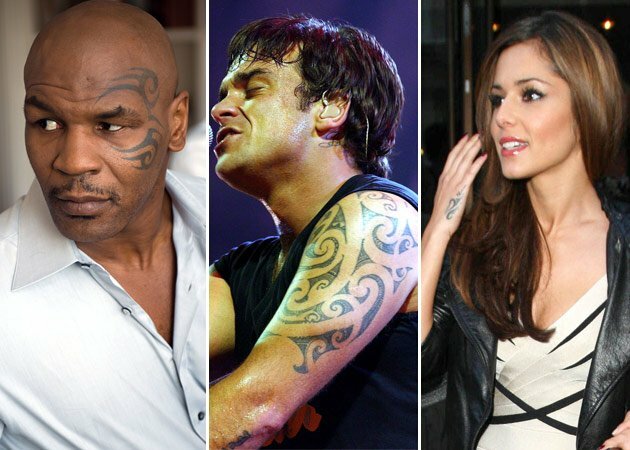 Tribal feuds Above: Mike Tyson, Robbie Williams and Cheryl Cole all sport tribal markings. "I'm not a big fan of doing Tribal work and cover ups," says top tattoo artist Louis Molloy, resident artist at Manchester's Middleton Tattoo studio, and the star of TV show London Ink. "Also, because of some of the work I've done on celebrities, I've gained a good reputation for doing religious-themed work but I feel that I've done so much over the past 10 to 12 years that it no longer holds the same appeal. I most often get requests for religious-inspired work - not because people are overtly religious but more that they like the 'look'." Indeed, while that Celtic cross or tribal etching may have seemed like a good idea at the time, in ten years time will you really feel the same? The colour, position and size of your tattoo will all affect the ease with which it can be removed, if, God forbid, you decide that your visit to the tattoo parlour was one you'd rather forget. Part of the reason more people are opting to get inked is the wider range of colours available - black is no longer the only option. The bad news? These brighter colours are also the hardest to remove. "Red, green and blue are the hardest colours to remove from a tattoo," says Louis. "The reason for this is that the current laser technology works on the light spectrum. These colours are the ones that the laser has trouble "seeing" because the wavelengths of the colour spectrum are all different and most lasers can only work at certain wavelengths. It may seem strange but black is the easiest colour to remove." 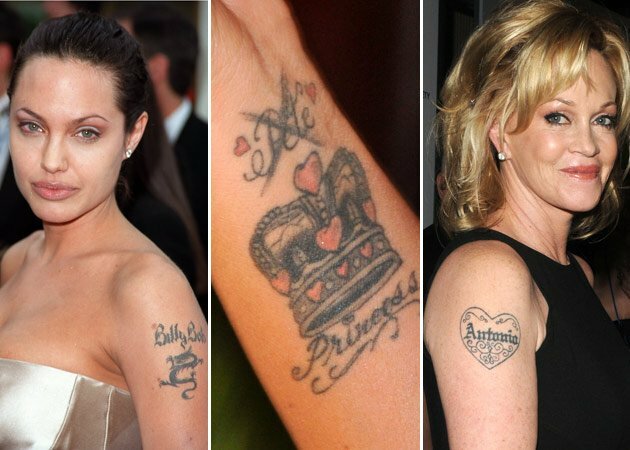 The name game Above: Angelina Jolie, Katie Price and Melanie Griffin have all been branded with their lovers names. It pays to be equally cautious when it comes to names. You may well have met his parents, moved into his house and even snuck your make up into his bathroom cabinet, but is a permanent piece of body art really the best way to declare your undying love for your other half? If things turn sour, the tattoo will be a painful reminder of a failed relationship. This doesn't just mean tattoos of his name either. "Any form of "love" declaration should not be taken lightly," warns Louis. "Even if it's some form of cryptic image, if the couple split up there will always be a reminder." So what type of tattoo does Louis love to do most? "My favourite style of work is Japanese because the designs work very well on the body - I'm currently looking at work that was done in the Meiji period of art in Japan (1860 - 1912). This was the time when the art in Japan was a big influence to artists in the west - impressionists and designers like Morris and Mackintosh - and I'm trying to create works that come somewhere in between the two worlds." We all have different pain thresholds, but when it comes to tattoos, those with lower ones might consider avoiding certain areas, although Louis admits that there are also those who love the endorphin-induced high they experience while getting a tattoo done. "Generally, bony areas are the most painful to work on. However, no tattoo could ever be described as painless - for the most part the pain is bearable and sometimes with the release of endorphins people will often describe the experience as pleasurable." If you've got a friend with multiple tattoos, there's a good chance the following thought has popped into your head as you've admired his or her body art: "But what about when you get old?" In reality, no tattoo is going to stay the same, whether it's due to pregnancy, weight gain or loss or age-related sagging, but them again, if you truly love your tattoo, the fact that it's changed shape slightly probably won't be too much of a concern. "I think the truth is that most old people who are tattooed couldn't care less because the tattoos become a part of you," says Louis. "If you're worried about this, areas to avoid would be breasts and the stomach on men and women. The best places would be the arms and shoulder blades." For the same reasons, it's also worth avoiding tattoos which express personal opinion (you may well currently love the Wanted, but will you really feel the same when you're ninety?). Remember that the tattoo artist wielding the needle is there to create your desired tattoo, and isn't obliged to tell you that you might be about to make the worst decision of your life. "Extreme tattoos being done are down to the discretion of the artists," says Louis. "We are supposed to live in a free society where people can express their views or opinions however they wish but doing it as a tattoo is not always a wise thing to do. Just because a tattooist does this kind of work does not mean that they agree with the views in question." Indeed Tyler Borich at American Electric tattoo salon, which featured on Miami Ink, makes a very good point.